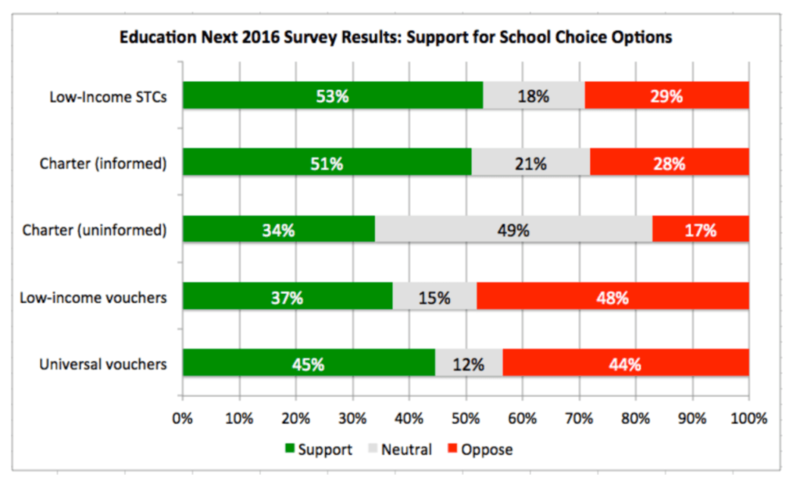 While overall support for school choice has remained high over the past year, support for the use of vouchers to access the choice program has fallen, says a newly released Education Next (EdNext) poll. The 2016 EdNext survey finds that overall public support for charter schools as an alternative to public schools is at 51% and support from parents is at 52%. 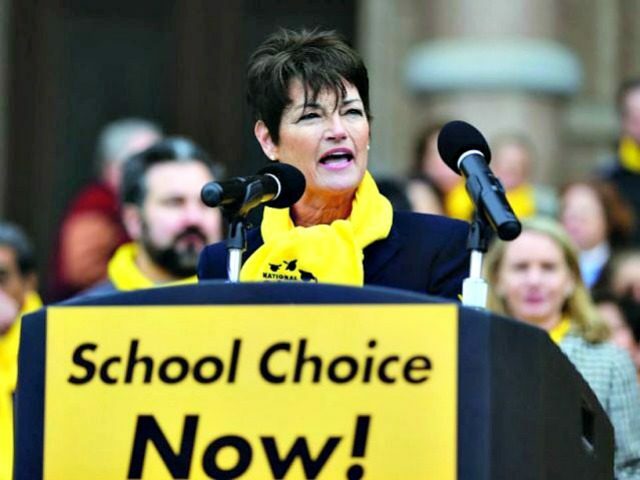 School choice, however, can be designed in several ways, primarily through school vouchers, education savings accounts (ESAs), and scholarship tax credits (STC), which differ in terms of the level of state regulation that may be required of the schools that participate in the choice program. EdNext finds a drop in public support for school vouchers. Support for vouchers targeted for low-income families is at 37% in 2016 and for universal vouchers for all families at 45%. However, 53% of the general public and 60% of parents in 2016 back scholarship tax credits for individuals or companies that donate to foundations that provide scholarships to low-income students to attend private schools. That percentage backing STCs is increased from 46% since 2009, though down from its highest level of 60% in 2014. “The EdNext findings on school choice suggest that program design matters,” Lindsey Burke, Will Skillman education fellow at Heritage Foundation, tells Breitbart News. The poll results found a drop in support for school vouchers, which could reflect recent experiences in states that have heavily regulated their school voucher programs, leading, paradoxically – as the regulations were promulgated in the name of accountability – to lower participation among high quality private schools. It is also possible that lower support for vouchers could reflect a desire for a more refined version of school choice, in the form of education savings accounts (ESAs). ESAs have been highly popular in states considering adopting education choice policies, and more and more families are now benefiting from the customization that ESAs enable. Lance Izumi, Koret senior fellow in education studies and senior director of the Center for Education at Pacific Research Institute, tells Breitbart News the EdNext poll finding that school vouchers have declined in popularity is mainly due to their demonization by liberal political, education, and media elites as well as the teacher unions. He views the fact that 45% of the general public and 59% of parents still support universal vouchers is a sign that the drive for school choice is significant in the United States. The fact that a slightly larger proportion of the general public supports universal vouchers than opposes them, by a 45% to 44% margin, indicates that the appeal of vouchers is still significant, despite the long war waged against them by their well-funded and entrenched political and establishment enemies. That plurality pro-universal-voucher margin, to me, says that despite all the demonization of vouchers, people are dissatisfied with the public education system and want some type of exit mechanism for children who are being failed by that system. The concept of “school choice” is very appealing, but the reality is that vouchers are a transfer of taxpayer funds from a public school to a private or religious participating school. If parents “choose” to send their children to a participating school, that school may have additional regulatory burdens placed upon it by the state in which it is located – in the name of “accountability” – in order to qualify for the school choice program. The overarching question then becomes why transfer a child to a school when it might have the same regulations, test requirements, etc. as the public school? Izumi observes that the EdNext findings provide a clear “political lesson.” “People want choice for all children, including their own, not just for kids in someone else’s neighborhood,” he says.